The first annual(?) 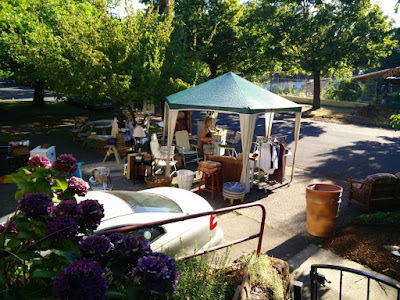 Home and Patio Sale wrapped up last Saturday! It exceeded all my expectations! We opened on Friday and had steady customers all day. 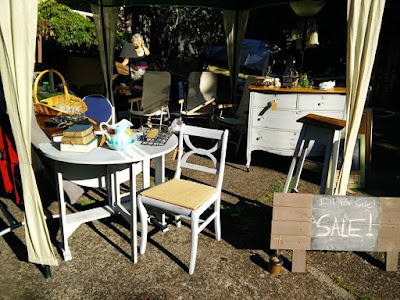 By the end of the day, nearly all the furniture had sold! I apologize to anyone who may have come on Saturday. We did have a few pieces of furniture left but the majority was gone. Consequently, we were left with a bare dining room! That didn't last long though, as I found a beautiful Danish Teak table at a second hand store about a mile from my house. Now that my workroom is cleared out, I'm on the hunt again for free sidewalk furniture I can refurbish for another sale next summer! 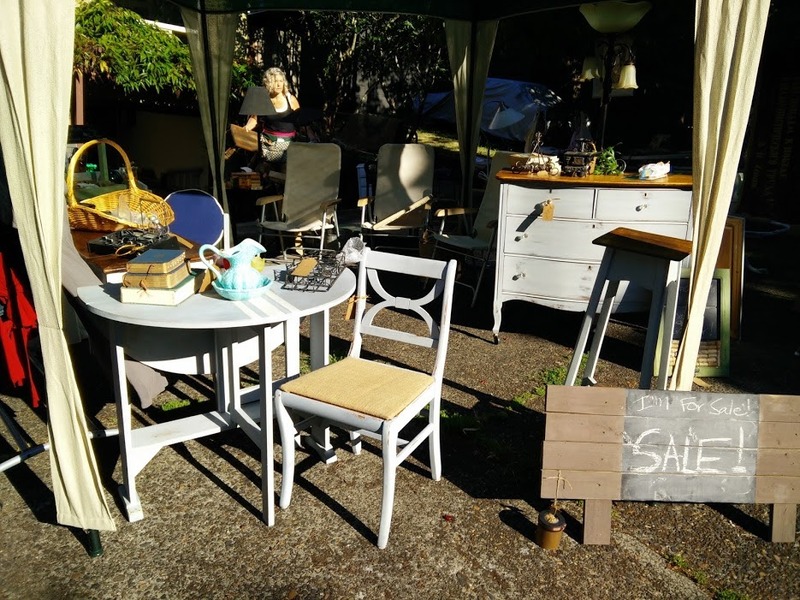 Stay tuned to this blog for more furniture makeovers and make your plans for next year to spend the last weekend of July in Portland for the Home and Patio Sale, conveniently timed to be the same weekend as the Oregon Brewers Festival! Last week my long awaited Boncho came in the mail. 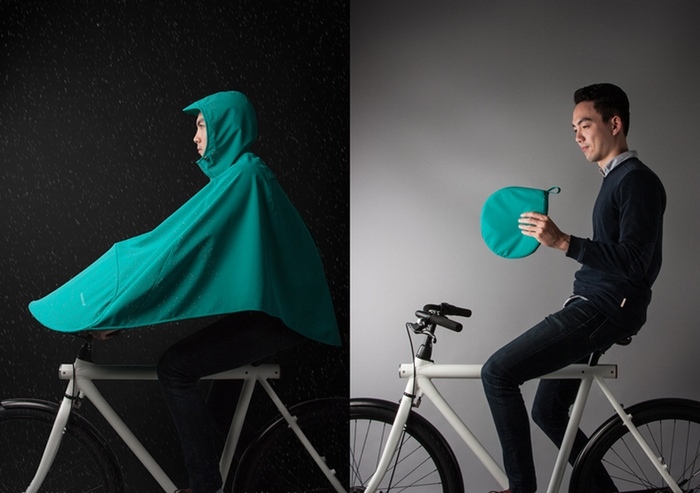 This is the bike poncho I helped fund on Kickstarter back in February. I'm excited to try it out on my daily commute to work, however, I'm not excited enough to hope it rains. Let's just say when it does rain, I won't be COMPLETELY bummed because I'll have my new Boncho to wear. 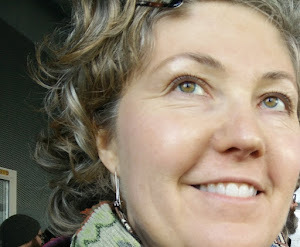 Lora's Beauty Online Store is welcoming August and looking forward to Fall with the addition of a new goats' milk soap! The Honey Ginger bar has made it's debut! The spicy scent of ginger combined with drips of honey make this a great bar for softening the skin. This is a special seasonal bar and will only be in the store while supplies last! Enjoy your summer weekend and pick up few Honey Ginger bars to entice Autumn!